1495 – Perkin Warbeck, pretender to the English throne landed at Deal in Kent with men and ships. On 3 July 1495, funded by Margaret of Burgundy, Warbeck landed at Deal in Kent, hoping for a show of popular support. Warbeck's small army was routed and 150 of the pretender’s troops were killed without Warbeck even disembarking. He was forced to retreat almost immediately, this time to Ireland. There he found support from Maurice FitzGerald, 9th Earl of Desmond, and laid siege to Waterford, but, meeting resistance, he fled to Scotland. Henry pardoned his Irish supporters, remarking drily "I suppose they will crown an ape next". 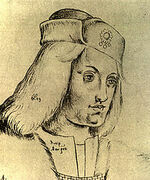 Warbeck was well received by James IV of Scotland who realised that his presence gave him international leverage. 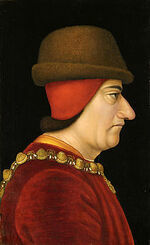 As Ferdinand and Isabella of Spain were negotiating an alliance with Henry VII, James IV knew that Spain would help him in his struggles with England, in order to prevent the situation escalating into war with France.Spanish ambassadors arrived in Edinburgh, and later Pedro de Ayala was established as a resident ambassador during the crisis. Warbeck was permitted to marry James's distant cousin, Lady Catherine Gordon, a daughter of George Gordon, 2nd Earl of Huntly. The marriage was celebrated in Edinburgh with a tournament. James gave Warbeck clothes for the wedding and armour covered with purple silk.The historian Katie Stevenson suggests the clothing bought for the tournament shows Warbeck fought in a team with the king and four knights.A copy of a love letter in Latin obtained by Pedro de Ayala, is thought to be Warbeck's proposal to Lady Catherine. 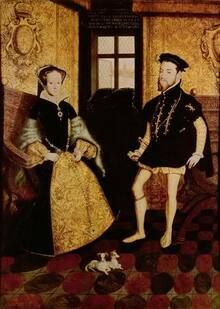 1533 - Catherine of Aragon was visited by a deputation of Councillors led by Lord Mountjoy. She was told that if she would submit to the King's wishes he would provide her with a handsome estate but that if she persisted in her obstinacy things would go badly for her daughter and servants.William Blount,her chamberlain, was ordered to inform Catherine again that she must recognise her new title of ‘Princess Dowager’ and not use the title of ‘Queen’. Instructions for the right honorable lord Mountjoye and Gryffith [Richardes] to be declared to the Princess Dowager. 1. They shall say to her that "after declaration made by Vaux concerning her removing ... and given to the said Vaux therein, commanded his council to give ear unto the same, and to determine in that behalf as appertaineth to his princely honor and estate." The King has always had a special regard to the preservation ... and subjects, and to keep the same in tranquillity ; and now, considering that, notwithstanding sundry monitions given to the Princess Dowager not to use the name of Queen, as the King, finding his conscience violated, grudged, and grieved by that unlawful matrimony contracted between him and the Dowager, which was defined and determined by a great number of the most famous universities and clerks of Christendom "to be detestable, abominable, execrable, and directly against the laws of God and nature," was therefore lawfully divorced, and by advice of all his nobles, spiritual and temporal, and all the commons of his realm, was married to the lady Anne, who has been crowned Queen. As the King cannot have two wives he cannot permit the Dowager to persist in calling herself by the name of Queen, especially considering how benignantly and honorably she has been treated in the realm. She is to satisfy herself with the name of Dowager, as prescribed by the Act of Parliament, and must beware of the danger if she attempt to contravene it, which will only irritate the feelings of the people against her. If she be not persuaded by these arguments to avoid the King's indignation, and relent from her vehement arrogancy, the King will be compelled to punish her servants, and withdraw her affection from his daughter. Finally, that as the marriage is irrevocable, and has passed the consent of Parliament, nothing that she can do will annul it, and she will only incur the displeasure of Almighty God and of the King. The report of lord Mountjoye, [Katharine's chamberlain,] Sir R[obert] Dymok, knight, John Tyrell, Gryf[fith] Richards, and Thomas [Vaul]x, upon certain articles by the King's most honorable Co[uncil] delivered unto them to declare unto the Princess Dowager, on the King's high[ness'] behalf. To the effect that on Thursday, 3 July, they found her lying on a pallet, as she had pricked her foot with a pin, and could not stand, and was also sore annoyed with a cough. 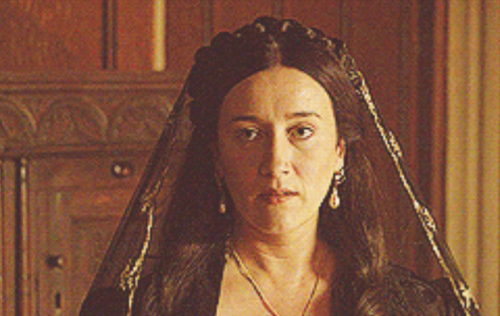 On our declaring that our instructions were to her as Princess Dowager, she took exception to the name, persisting that she was the King's true wife, and her children were legitimate, which she would claim to be true during her life. To our assertion that the marriage with Anne Boleyn had been adjudged lawful by the universities, the Lords and Commons, she said the King might do in his realm by his royal power what he would ; that the cause was not theirs but the Pope's to judge, as she had already answered the duke of Norfolk. To other arguments, that she might damage her daughter and servants, she replied she would not damn her own soul on any consideration, or for any promises the King might make her. She did not defend her cause upon obstinacy, nor to create any dissension in the realm, but to save her own rights ; and as for the withdrawing of the King's affection from her, she would daily pray for the preservation of his estate ; but as she sues by his licence, she trusts in so doing to lose no part of his favor. In fine, she will not abandon the title till such time as a sentence is given to the contrary by the Pope. She asked for a copy of these instructions, which she would translate into Spanish, and send to Rome.